Okay, it is always an occasion to praise God. For the last two days we had an amazing time with True Parents. And just incredible, so much blessing is showering upon us. I really feel this is a totally new year. For us in the Korean church, we are very excited because a month ago Father, while he was in America, asked us to do a 21-day-workshop in Yeosu, especially for the safety of the country. And that was a very tense time, because that was the time North Korea had already bombed Yong Pyong Do, so it was already an act of war. And it was very very close to coming to war on this peninsula, very very close. So we went down to Yeosu and we had a 21-day-workshop there. Father called me up during the middle, I had to go to America and come back, but it was really amazing. One of the things we began there is the “Holy Spirit Healing Service”, maybe you have heard about that. But for us, we really feel in the Korean Church now that the Holy Spirit is back in the Unifcation Church, that the Holy Spirit is back and is alive. It’s conducting all sorts of miraculous healings, amazing! Amazing! The Spirit is back! Guten Morgen! I hope, I said that right? It’s actually quite freezing in Germany. So maybe we can open some windows and really get cold, to stay awake. (laughter) I am heading to Great Britain today and then back to Korea. So, we have some Brits here? (cheers) All right, all right! We are very grateful to be able to come to Europe at this time. Actually we never planned to come to Europe, at this time, because I feel that I haven’t finished all my work that I have to do in Korea first. From the very beginning people requested, “Please do a world tour”. But I felt from the beginning, it is not appropriate for me to do a world tour. I felt that I have to first make real results that I can show. So we worked in Korea and we are able to turn around the media. We are now able to be fully self-sufficient as a church, which means that we don’t receive any support from our brothers and sisters in Japan. We are actually at a stage now where we can support them. Just a little bit, but it is so much different from the situation that was before. So, we are very proud of that. As you know, the church in Korea in 1970, as in many countries, had nationwide about 16,000 members. That was a lot of members. There were no real big mega churches at that time, so that was a huge congregation that father had. But then by 2005 we had about 11,000 members attending Sunday service. So as you see, we did not even get one new member as a movement. We didn’t grow. We didn’t just stagnate, we grew negatively. So we’ve lost members. This is, of course, not good. We had to address this problem. There were very serious changes that had to be done. I am very happy to say that after about a year and a half of making systematic changes, we are becoming transparent as a church and strengthening the organization. I am very grateful for my brother Kook Jin Hyeong who helped me greatly in that task. We went from 11,000 members all the way up to 23,000 in about a year and a half. 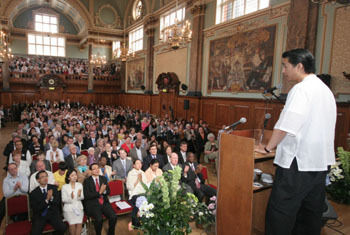 We are very proud that the Unification Church is now a growing church in Korea. It’s now a much more popular church than what it was in the past. The media has very kindly helped us. You can see that they were honest and they were moving in a trustworthy direction. There is a lot of exciting things going on in Korea, but we are still not anywhere near where we have to be. Brothers and sisters, it is really great to see all of you here in Germany today. We don’t have so much time together. So we’ll want to focus on something that is very central to our spiritual life. As you know, the broad foundation True Parents created is absolutely a miracle. I remember, when I was at Harvard University, we had to study also all these different religions, like Judaism, Christianity, Hinduism, Buddhism and Islam. We also had to study these new movements like the Mormon tradition, the Baha’is, the Hare Krishnas, the Soka Gakkai and other traditions. And in that course we also had to study the Unification Church. Actually it was very much fun. It was not done in a negative way at all, but we were treated in a very fair manner. They taught how Father started, how he received the revelation from Jesus and his meeting with Jesus. We also learned how he was later tortured and put into prison and eventually was received by heads of states – very much according to the text book. So this was very surprising. It was so positive. It was unlike anything I had seen before. I was so surprised. In Germany, we have maybe 400 to 500 blessed families and sometimes we feel very small. Islam is growing, many people are searching on different avenues. We may feel very small as a religious community and we don’t really have a sufficient foundation. We have to remember, before we move forward, how good God has been in bringing us up to this point.Yes, „Gott ist groß!“ We have to realise that there is no religion, in past or present, that has accomplished so much all the way from nothing until the world level while the founder is still alive. There is not one example. In Christianity, Jesus died after doing his mission for three years. If you study Buddhism, you realise, although Buddha has done great, he was not able to go to the world level. Even looking at Islam, Mekka and Medina became Muslim cities during the lifetime of the Prophet, but Islam was not yet able to move to the world level. Also when we look at other world religions, like the Mormons during the life of their founder Joseph Smith, or the Baha’is during the life of their founder Baha’ullah who died in prison – none of them was able to move to the world stage. The world’s religious leaders were not able to move to the world stage during their lifetime on earth. They were always persecuted and sometimes even killed.